This story is a weird one, honestly. It opens with the main character, Will Henry, having died of old age in a nursing facility. No friends or family to claim his belongings. Rick Yancey — yes, the author — gets a call from the head of the facility to see if he wants these journals. There are 12 total and Yancey takes the first three and turns them into this book. Then, we go back in time to the early 20th-century. Will Henry is 12. He’s an orphan, his parents having died in a fire, and is being raised by his father’s old employer, Dr. Pellinore Warthrop. Which is the best. name. ever. 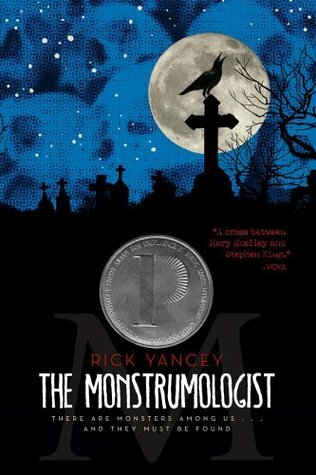 Warthrop is a monstrumologist. He studies monsters. And there’s one in their town. Anthropophagi, a creature far deadlier than humans. It’s a thrilling story with very intriguing characters who you can’t help but want to know more about. Will Henry is complex and interesting for the age he’s at. Warthrop is interesting as well and you can’t help but hate/love him at the same time. And this book is seriously thrilling. There are twists and turns and you’re kept on edge the whole time. But, my biggest cons to the book are: there are no female characters, the middle does drop off quite a bit with interest, and it can really get gory to the point where I wanted to vomit. Those cons did take away from my reading experience, but not enough for me to hate it. I just had to be careful about where/when I read it for the gore, then I had to be ready/engaged to read for the drop in the middle, and there wasn’t much I could do for the lack of female and other diverse characters. All in all, this is a great book and a fantastic opening to a series. I highly recommend it! If you’ve read it, how did you like it? If you haven’t, are you going to check it out? Great review. Sounds like a book I can get into. Yessss! It’s such a great one. Awesome! Then I guess I’ll go get then 😁 Thanks for the recommendation. It’s a four book series and, if you like it, you can read it in a week. It’s great and keep an eye out for my reviews of the next three books!